were found in areas that received rain all year round. As a general rule of thumb the deciduous varieties are much hardier, especially the newer varieties that have been bred locally in Northern Ireland and in Cornwall. The Evergreen varieties require more shelter in the winter months as they dislike excess rain and frost, although with "global warming" I am finding more of the tender varieties are surviving better outdoors especially if pot grown - and place your pots on a south facing aspect next to a hedge or tree for added protection as these will act as a microclimate; the more pots you put together the better. A usual tip is to fill some pots with peat or soil and place them around the plants you want to protect; this acts as natural insulation of course you can use manmade materials such as hessian or frost fleece. 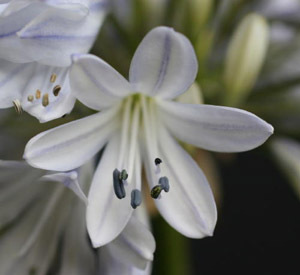 In Victorian times they used to place the Agapanthus in their pots into a much larger clay pot filled with straw and kept the pots in a cold frame. 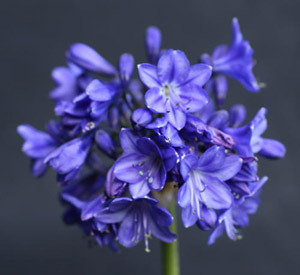 Agapanthus come mostly in varying shades of violet-blue through to dark purple and royal blue, even touching onto "black" with also pure white flowers. 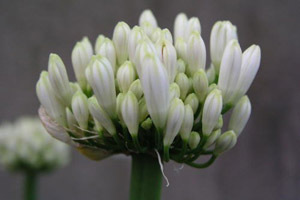 The flowers are mostly produced on long stems with a panicle of florets massing together to make a flowerhead. 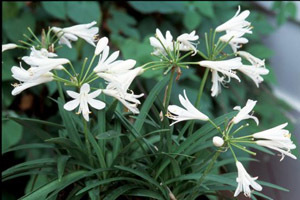 Each individual floret can be funnel, trumpet or salver-shaped (flattened back petals) with loose florets or compact florets. Some of the more dwarf varieties include Liliput, Thumbelina, Snowdrop, Snow Princess, Summer Snow, Beeches Dwarf, Dainty Lady, Kobalt, Midnight Blue, Silver Baby and Peter Pan. There are more but these are some of the better varieties.